Gimonnet is a grower Champagne house with more vineyard acreage in the Côte des Blancs than any other recoltant manipulant; 69 acres. The Gimmonets have many old-vine parcels in 30 acres of some of the Côte des Blancs’ choicest grands crus, but the house makes no Champagnes that meet grand cru regulations, rather chose to blend from different sites in order to craft their desired style. All of their reserve wines used for their NV are housed in bottles rather then the more common practice of keeping reserve wines in tanks. 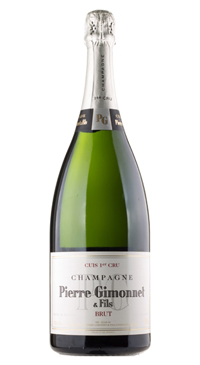 This Cuvée Brut Cuis 1er Cru represents the archetype style of the Pierre Gimonnet & Fils. It is a lively and light Chardonnay based Champagne with all of the freshness and purity of great Côte des Blancs. The dosage is just 8 g/L where many Brut designated Champagnes fall in between 10-12 g/L.